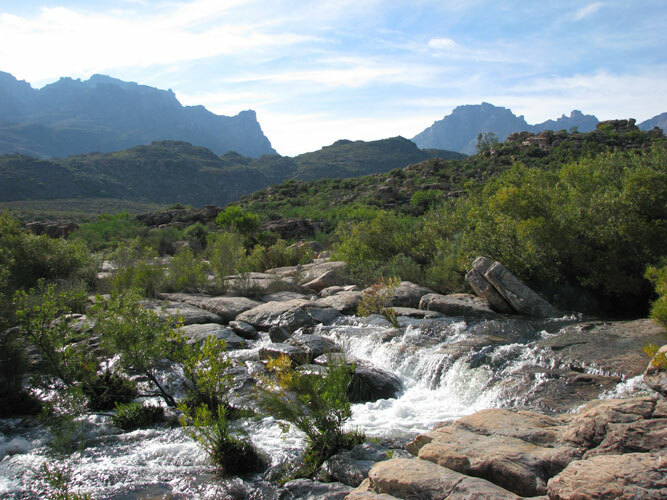 Majority of the Cedarberg is a designated Wilderness area and falls within the Cape Floral Kingdom. 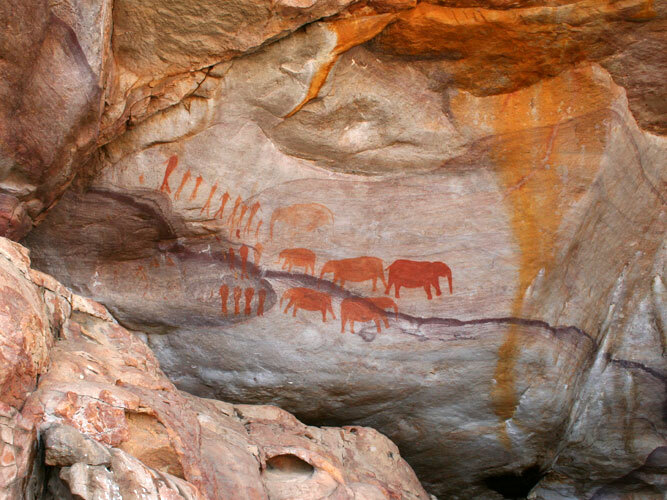 During the flower season, you’ll see the brightest blooms and at any given time you can view incredible rock formations and bushman rock art (see photo below). Picnic beside waterfalls and in the summer, enjoy a swim in one of the rock pools in the rivers or go on a rooibos farm safari. Choose one of these well-known trails; Maltese Cross, Wolfberg Cracks and Pakhuis circular walk. One thing’s for sure, you’ll find peace and quiet in this area. Keep your eyes open for porcupine, honeybadger, clawless otter, klipspringers and duikers. Nothing encourages bonding like having to work together and synchronise your strokes in a canoe. Rent one and go paddling on the Clanwilliam dam. In summer, it can get extremely hot, so try going later in the day just before sunset to avoid burning and to add a romantic touch to the day. Where else can you say you’ve hiked up the mountain on a donkey? Enjoy a donkey cart trail with your loved and choose between a day trail and an overnight stay. The trail begins at the top of the Pakhuis pass and will include refreshments. Stay at the Mount Cedar Lodge on Grootrivier Lodge between the Cedarberg and Koue Bokkeveld Mountain ranges. Spend quality time relaxing in this serene environment or for the more adventurous, mountain climbing. These beautiful cottages overlook at the river and one has a Jacuzzi on a wooden deck. If you’re keen to stay on a working fruit farm, then Pomegranate Cottage is a lovely choice. You can relax with wonderous views of the Swartland valley from the height of the Olifants River Mountains. It is private and secluded and you can spend hot days swimming in the farm’s dam. You can keep cosy in winter beside the fire and enjoy the indoor braai or grab the canoe on your own private deck on the dam. Oudrif is another gem to escape to without the kids. You’ll stay in straw bale cottages beside the Doring River perfect for paddling, swimming or sun bathing on deserted beaches. Enjoy romantic dinners and drinks in the boma where you can also star gaze to your delight. 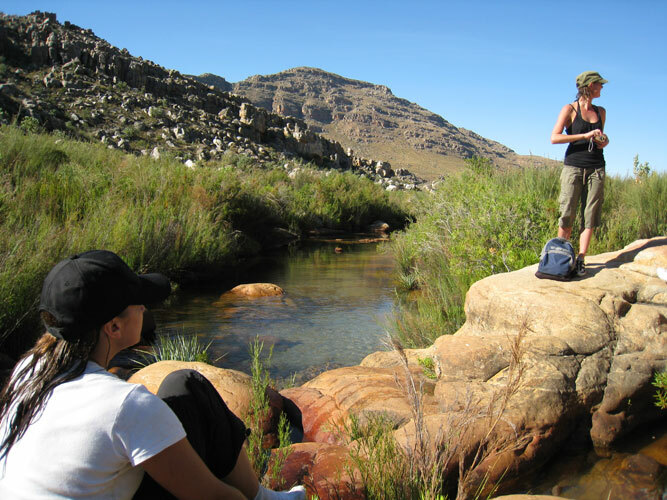 I love cederberg, I used to go alot as a kid, its absolutely stunning, definitely the best camping getaway I have ever been on!